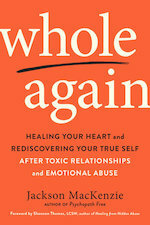 I'm so excited to announce that Whole Again is now published! I am so excited to share this book with the world, and I am beyond grateful for all of the friends and professionals who made it a reality. At the end of my last book, I described a “tight feeling in my heart”. It wasn’t painful or sharp, just a constant numb squeezing sensation. All day, every day, from the moment I woke up to the second I fell asleep. I've since learned that I wasn't alone. Trauma often manifests as strange sensations in the body: numbness, tightness, emptiness, voids, hollowness, tension, blockages, agitation. Along with these mysterious feelings, there tend to be a bunch of psychological and behavioral changes too: people-pleasing, self-doubt, fatigue, accomplishing, perfectionism, mood swings, isolation, over analysis, insomnia, rejection, depression, guilt, excessive daydreaming, irritability, jealousy, inadequacy, worthlessness, need for control, resentment, paranoia, rumination, care-taking, substance abuse... The list goes on, and it's unique to every individual. We may struggle to trust ourselves, fall in love, or experience genuine happiness. Instead, a protective part of ourselves has taken control, to ensure this pain never happens again. Love becomes conditional, waiting for others to show their cards before we show our own. Identity and personality become shaky constructs, kept afloat by external measures of worth. In these cases, time does not seem to heal all wounds. One of the most frequent phrases I hear from readers is: “I miss my old self.” As if the old self has gone away. And that's why I've written this book. I think there is a part in all of us that feels love and joy for no particular reason — the life energy that surges through our bodies — allowing us to feel light, free, humorous, grateful, whole. Throughout the course of life, certain events "disconnect" us from that source — childhood traumas, difficult relationships, rejection from loved ones, it really could be anything. And when we're "disconnected" from this source, we're bound to struggle over and over again. Our inner world is damaged, and it distracts us with a never-ending quest for external solutions. But I keep putting "disconnected" in quotes because the true self didn't actually go anywhere. It is not fractured, it is not broken, it is not destroyed. There is a way back to this bliss, and as my heart began to open this year, I felt compelled to share what I've learned (and where I've stumbled) in a new book. Written in the same conversational tone as my first book, my goal is to explore how our minds and bodies work to protect us — so we can release old wounds and safely let the love back inside where it belongs. I would also like to thank a few people: My agent, Emmanuelle Morgen, for introducing me to the publishing world. In her ongoing mission to help abuse survivors, she got PF onto bookshelves, recorded as an audiobook, and translated into 7 languages. I am so grateful for her drive and dedication. My new editor, Marian Lizzi, for believing in this project and bringing more resources to our community. And finally, to my friends & family who listened to me talk about "that feeling in my heart" for years.